AND 17 MORE LOTTERIES AVAILABLE IN OUR IOS AND ANDROID APPS NOW! You can download our app from App Store or Google Play for free! There are tons of ways how to get more points: get daily points, invite friends, do tasks, etc. We have lottery every 3 hours so just find your best lottery and get chance to win! Become a winner and get reward in your Steam inventory! Are you a true Dota 2 fan? 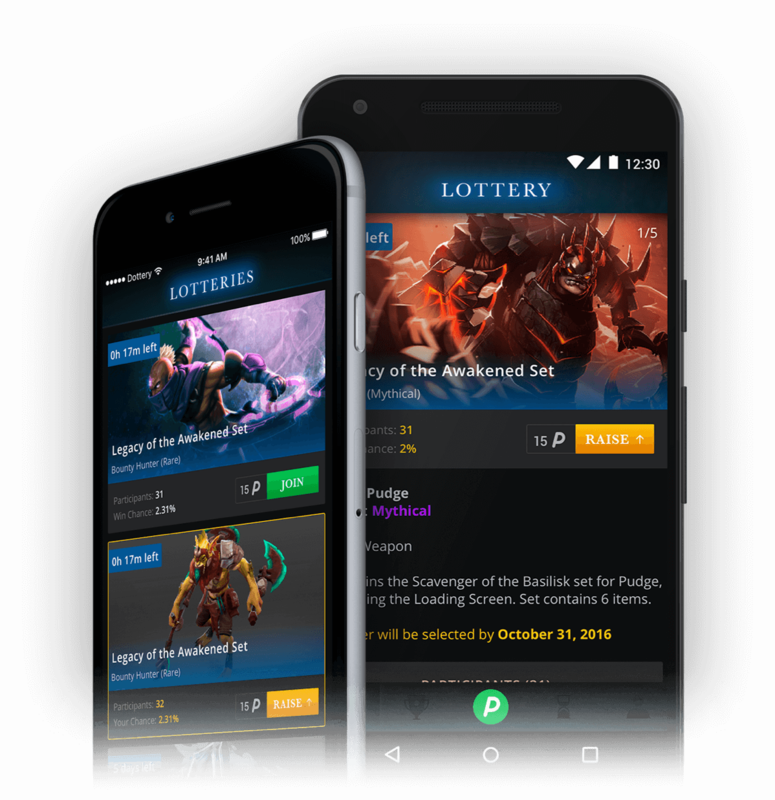 Then here is Dottery app - a free mobile application where you can win free items for Dota 2! Dottery allows you to get Dota 2 free skins every day! Participate in item lotteries and win them! Free points for free item roulette! 5 points each day just because you love dota heroes. Install, join any skin lottery, collect your rewards! Raise! More tickets = more chances to win free dota 2 skins. If you lost - no trouble, we will get points back for the best 3 participants ;) Find sets and arcanas in dota 2 lottery. Have a question? Don’t be a stranger, approach us !